KAW wrote: Thanks msteele6 for those pattern numbers. Would you happen to know the time range they were offered? I'm trying to pin down the probability of them being made by Walden. The K0678 3/4 is shown in Sellen's as being produced from 1914 thru 1920 therefore I believe that it is a Walden produced knife. The K2718 3/4 is shown being produced from 1905 thru 1929 therefore it might have been produced at the Winchester plant after the acquisition of Walden, still probably a Walden pattern produced on Walden equipment by Walden workers primarily. Thanks Joe for the complement. Great info msteele6! ... just what I was hoping for! 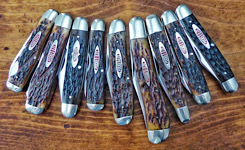 Would you know anything about the fixed blade knife with MoP handles? Is it a steak knife? It has a razor sharp edge with the the logo stamped in the middle of the blade. means.... never having a dull moment. Nice finds, Ken! Great master blade on the coke bottle. I am intrigued by that lovely MOP fixed blade. I don't think I've ever posted this knife here (or anywhere, at least until yesterday). It's an ugly, worn-out HOK but it's a Simmons. Tsar Bomba wrote: It's an ugly, worn-out HOK but it's a Simmons. Tony, that truly is an honest old knife, I don't find it ugly at all! Tsar Bomba wrote: I don't think I've ever posted this knife here (or anywhere, at least until yesterday). It's an ugly, worn-out HOK but it's a Simmons. Here's a nice little whittler. 2 7/8" closed. I can't find this exact knife in Sellin's book. He does show a K3808 with a bar shield and a milled back. That is a beauty, Joe! Still has some blade etch left to boot! Thank you so much for your comments, Lloyd and Dan. That's one beautiful little knife Joe, very nice!!! 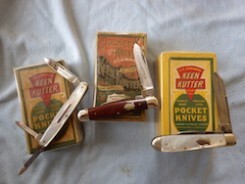 Here are 2 Keen Kutters I bought today at my local antique store. Any info on them would be appreciated. I am unfamiliar with Keen Kutters. Thanks for looking. FRJ wrote: Thank you, Bill.